Exactly one year ago, Pierre Dorion was forced to cut his son’s birthday dinner short. On Nov. 5, 2017, the Senators general manager was putting the finishing touches on executing a massive three-way trade with the Colorado Avalanche and Nashville Predators. As a result, he had to excuse himself from the dinner table as the final pieces were falling into place. “I hope I didn’t ruin too many Sunday evening dinners. It was my son’s birthday. I left after my bowl of wonton soup and I apologize to him,” Dorion said with a wry smile in his opening statement after acquiring centre Matt Duchene. Dorion can probably enjoy a distraction-free birthday dinner with his son this year – although the Senators general manager will still have a lot on his plate when it comes the fallout from that trade. After landing Duchene one year ago, Dorion was confident the Senators could push themselves into the conversation of legitimate Stanley Cup contenders. But instead of moving up to the high-rent district, the Senators have watched themselves plummet to the NHL’s basement in the past 12 months. With exactly one year of hindsight, it’s a natural time to re-examine the blockbuster deal. Would the Senators have just been better off hanging onto Kyle Turris and then flipping him out at the trade deadline? It’s worth remembering that the Senators had reached a significant contractual impasse with Turris, one that didn’t appear to be headed to an amicable solution. That obviously started the clock ticking on his time in Ottawa and Dorion knew he couldn’t let Turris walk out the door for nothing. But instead of landing future draft picks or prospects – which are often the pieces acquired when moving a pending UFA – Dorion decided to swing for the fences by using Turris to land Duchene. It also cost him 2017 first-round pick Shane Bowers and a future first-round pick in either 2018 or 2019. It was universally seen as a steep price to pay, but Dorion was convinced Duchene was a significant upgrade on Turris. Dorion was still in his ‘win-now’ mentality, firmly believing the Senators best chance to compete for a Stanley Cup would come with Erik Karlsson in his prime and playing on a very reasonable contract. The issue that most Sens fans have with this deal is that Dorion pushed all of his chips into the middle of the table, but then a few weeks later, he folded. The Senators fell into an abyss after an extended losing streak and about 12 weeks after acquiring Duchene, the organization was suddenly touting the merits of a rebuild. On Nov. 5, 2017 they announced the acquisition of Duchene with a big, splashy press conference. By Feb. 9, 2018, they quietly announced a three-year contract extension for Dorion with a press release strongly hinting that a rebuild was on the horizon. It was certainly as drastic of a 180-degree turn in philosophy as any professional sports team has had within a three-month window. If the Senators had simply hung onto Turris, they likely would have been able to turn him into a first-round pick – or something close to that – around the trade deadline. Near the 2018 deadline, seven first-round picks changed hands and a team like the Winnipeg Jets were willing to give up their first-round selection in exchange for pending-UFA centre Paul Stastny. So logic dictates there would have been a market for Turris and the Senators could have had a nice piece or two in return for him. There’s no doubt that if they were going down the path of a rebuild, hanging onto Turris would have been the “no-brainer” option. Instead, the Senators have been put into a very awkward position of starting a rebuild without owning their 2019 first-round pick. And to add another layer to their conundrum, they also need to decide what to do with Duchene’s contract. That could be the key to truly figuring out if the Senators can salvage this trade. In Duchene’s defence, he’s delivered as advertised as a bona fide No. 1 centreman. He’s produced at almost a point-per-game clip, generating 55 points in 59 games in the calendar year 2018. Those are terrific numbers and put him in directly in line with other star centres like John Tavares (51 points in 57 games in that span) and Steven Stamkos (47 points in 54 games). The Senators have fallen off a cliff since Duchene’s arrival, but it seems disingenuous to lay the blame for their demise at his feet. It feels more coincidental than anything else. But if the Senators are truly committed to a rebuild, perhaps it makes sense to move Duchene before the deadline and acquire a sorely needed first-round draft pick in return. At his introductory press conference last year, Duchene said he was “dying” for the opportunity to get close to the Stanley Cup. “I want to be a part of a long playoff run – that’s the goal,” he said at the time. Duchene also stated flatly that he didn’t want to be part of a re-build in Colorado, which is why he asked Joe Sakic for a trade. Two weeks ago, Duchene said he felt like he didn’t want to simply bolt as a free agent from the Avalanche and leave them “high and dry” – which is why he asked for a trade in the first place. The same logic would likely apply to his situation in Ottawa. 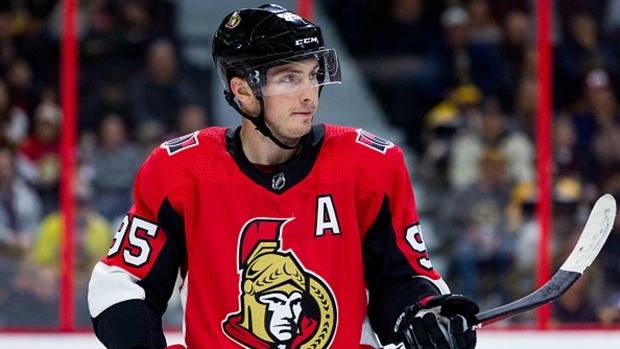 If Duchene doesn’t want to be part of a prolonged rebuild, he would likely have expressed that to Dorion in some way, shape or form – so that the Senators general manager would be prepared for the scenario of moving him. If Duchene didn’t want to leave Sakic high and dry, why would he want to do that to Dorion? Still, Dorion sounds optimistic that he can get a contract extension worked out with Duchene and a 90-minute meeting with his agent Pat Brisson in Toronto last month was characterized as positive. He refuses to divulge anything about the nature of the contract talks and has now started using a standard line when he is asked about Duchene’s future in Ottawa. “Hopefully, our next discussion on Matt Duchene is when we can hopefully announce a contract,” Dorion has said multiple times in the past few weeks. Re-signing Duchene would be a huge coup for Dorion and the Sens, who would obviously love to show their fan base that they still have the ability to acquire and hold on to star players. But again, is re-signing him the best strategy for a team that is undergoing a significant rebuild? As we’ve seen in the past 12 months, hindsight is easy when it comes to analyzing the Duchene situation. The trickier part now for Dorion is having the foresight to get the next move right.